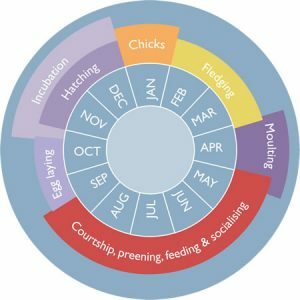 Mid-August: The 28-week breeding season begins when partnerships are formed or renewed, and nest sites are selected. Mating takes place. Mid-September/October: Two greenish-white eggs, about 75×55 mm in size, are laid. Both parents take turns to incubate, which takes about 43 days. November/December: The eggs hatch and the guard stage begins. This is a 40-50 day period when one parent stays at the nest to brood while the other fishes. Upon their return they perform an elaborate greeting ceremony of trills and calls before feeding their hungry chicks. Although guarded constantly during this stage, the chicks are still vulnerable to predators. January: By the time chicks are 6-7 weeks old, both parents must fish each day to satisfy the voracious appetites of their demanding young. This is the post-guard stage and towards the end the chicks will start to lose their soft brown down. February: The chicks fledge into their waterproof plumage and go to sea, an extremely hazardous time, with fewer than 20% surviving to maturity. March/April: The parents have just a few weeks to recover and put on weight before beginning the annual moult. They are confined to land whilst they wait for their old feather coat to be replaced. Early-May: Sleek and shiny in their new plumage, the penguins head out to sea, but return most nights to sleep, preen and socialise. Soon it will be August and the busy breeding season will begin again. About 80% of surviving juveniles will return to breed at the place where they were hatched. Hoiho are devoted parents. Incubation of eggs and raising of young are shared responsibilities. During a good breeding season yellow-eyed penguin pairs can successfully raise two chicks.